Managing your diabetes can seem like your second full-time job when it comes to all the work you have to do. You need to keeping track of your glucose levels. Carefully monitor how many carbs you ingest. Watch your meal sizes and your activity level. You also have to make regular visits to a whole host of specialists, including (but not limited to) your podiatrist, endocrinologist, dentist and general doctor. 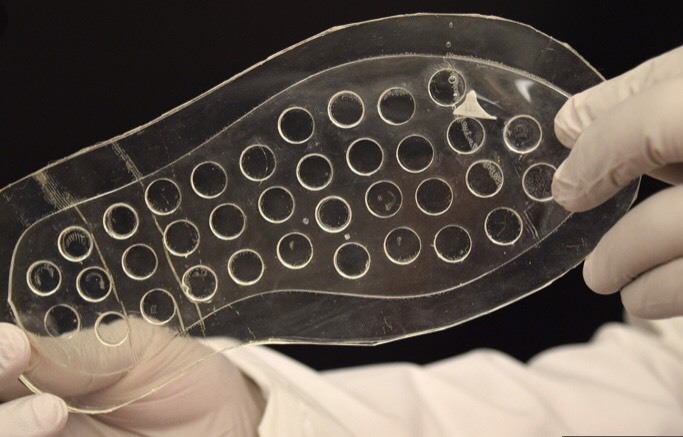 According to a new paper in Materials Research Society Communications, a powerful new insole is in prototype stages at Indiana's Purdue University. The design is for a two-layered insole constructed from a type of silicone known as polydimethylsiloxane. But the second layer is extra special: it’s actually a chamber that contains oxygen gas. The top layer is designed to be especially permeable to oxygen, thanks to some laser-ablation, so that the restorative gas can be targeted to reach the exact spot where your ulcer is located. The concept is simple but brilliant: as you walk throughout the day, you put pressure on the insole, forcing oxygen out of its bottom layer, through its top layer and onto the oxygen-starved skin of your ulcer. As the oxygen reaches the ulcer, it helps speed up your healing, meaning your recovery process is getting a boost all day long. Even when you sit, your foot puts a small amount of pressure on the insole, meaning at least some oxygen will be pushed out through the two layers. Currently, the insole is created with special lasers, but the researcher’s ultimate goal is to bundle print the insoles using a 3D printer, thereby reducing costs and increasing availability. While the product is still in development, clinical trials with diabetic patients should be underway in the near future. Jackson State University engineering students have developed a product designed to help prevent the development of dangerous foot ulcers on diabetics’ feet. When researching ways to prevent the foot amputations that are an all-too-common diabetic complication, the JSU students discovered that colder feet were predictive of the kind of nerve damage that causes diabetics to lose sensation in their feet. Once diabetics lose foot sensation, wounds may not be easily discovered, making ulcers a more likely complication. Realizing the chain of effects that could be started by a simple drop in foot temperature, the students designed their mat to connect to an App that tracks daily foot temperatures. If used every day, as intended, the mat could function as an early warning system for circulatory issues and nerve damage, inspiring diabetics to be more aware of potential hazards during their daily foot exams. If you’re sensing a theme in the tech available for diabetics, you’re not wrong: all of these products are designed to monitor changes in your feet, and these socks are no exception to that rule. The SenseGO ‘smart socks’ are the brainchild of students from the Hebrew University in Jerusalem. They are designed to detect areas of pressure on your feet and then relay that information to a smart phone app. People with diabetes must be aware of weight imbalances affecting their feet, as extra pressure can result in wounds, and we all know that wounds can develop into limb-threatening ulcers without proper treatment. The machine-washable socks incorporate dozens of micro-fabricated pressure sensors, carefully placed to detect potential problem areas. If issues arise, the sensors send an alert to the patient’s phone. While pressure-sensing insoles are already available on the market, this product is the first designed to detect pressure changes on any area of the foot, not just on your sole. Assistive technology is a fantastic resource for diabetics, but it should always be seen as an addition to your care routine, not a replacement for what you’re already doing. While it may be tempting to trust your socks to note potentially dangerous changes in your feet, no pre-programmed device will perform as vigilant an exam as you and your doctor. Just remember, look for help when you need it, but always stay true to the basics of diabetic foot care: daily self-exams and bi-annual (or more) checkups with your podiatrist!